Bang Energy Drink is a "workout" type of energy drink made by VPX Sports, the maker of Redline. Bang originally had 357 mg of caffeine per can but has since been lowered to 300 mg of caffeine per can. Bang should be consumed responsibly since a person could experience a caffeine overdose if too much of this drink is consumed at once. Bang is marketed as a fat loss aid and energy stimulator for those trying to increase their workout intensity and lower body fat percentage. Some flavors are also available in a caffeine-free formulation. Bang Energy Drink's energy formulation is a combination of Creatine, Caffeine, Amino Acids (BCAAs), Electrolytes, and B Vitamins. 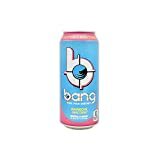 Warning: Bang is a powerful energy drink with 300mg of caffeine per can. It should not be consumed by children, those with heart problems, or those unsure of their personal tolerance to caffeine. 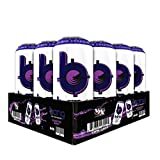 Bang is sugar-free and sweetened with sucralose and Ace-k.
BANG Energy Drink contains 18.75 mgs of caffeine per fluid ounce (63.40mg/100 ml). Data Sources: https://bang-energy.com plus an email from customer service and info printed on the can.